Got questions? Try the FOA Guide and use the site search. Optical Loss: Are You Positive It’s Positive? A recent post on a company’s blog and article on the CI&M website discussed the topic of the polarity (meaning “+” or “-“ numbers) of measurements of optical loss, claiming loss was a positive number. The implication was that some people failed fourth grade math and did not understand positive and negative numbers. The claim is that insertion loss is always a positive number. Is that right? With logarithms, if the ratio of measured power to reference power is greater than 1, e.g. measured power is more than reference power, the log is positive. If the ratio of measured power to reference power is less than 1, e.g. measured power is more than reference power, the log is negative. If the ratio is 1, the log is 0. Since the logarithm for optical power ratio is base 10 and then multiplied by 10, each change of 10 in the ratio of the measured and reference power becomes a change of 10dB. E.g. +10 dB is a factor of 10 (10 times log10 10 which is 1), +20dB is a factor of 100 (10 times log10 100 which is 2), +30dB a factor of 1000 (10 times log10 1000 which is 3)and so on. Negative dB means division, so -10 dB means a factor of 1/10th (10 times log10 0.1 which is -1), -20dB a factor of 1/100th (10 times log10 0.01 which is -2) and so on. 0 dB means the measured power to reference power ratio is 1 – they are equal. Let’s try a graphic explanation of this equation. Take a look at this “semi-log” graph (logarithmic on the x axis and linear on the y axis) of dBm vs optical power in the range commonly used for fiber optics and calculated with our equation above. Remember 0 dBm means all power is referenced to 1 milliwatt optical power. As you move to the right, power increases and the value in dBm gets more positive – that would be gain. So from 1mw to 10mw, we see a gain from 0dBm to +10dBm or 10dB, a positive change. As you move to the left, to lower optical power, as would be loss, the dBm value gets more negative. 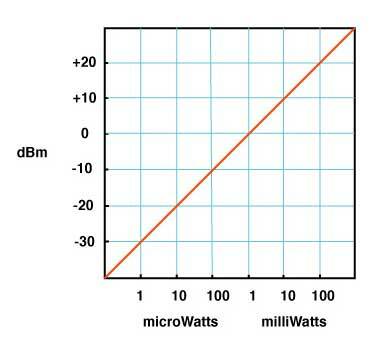 From 1mw to 100microwatts (that’s 1/10mw), we go from 0dBm to -10dBm, or -10dB; that negative change indicating a loss of 10dB. How about an example? Let’s say we decide to test a singlemode cable plant. We start with a laser source and launch cable which we measure our reference level for loss with a power meter to have an output of 0dBm. That’s 1 milliwatt of power, about the normal output of a fiber optic laser. After we attach the cable plant to test and a receive cable to our power meter, we measure 3dB loss. What power did we measure? The power must be lower, of course, since we have loss, and 3dB is approximately a factor of 2, so the power the meter measured is 1mw divided by 2 = 1/2milliwatt or 0.5mw. Since our power meter is measuring in dBm, it will read minus 3dBm (-3 dBm), since lower optical power is always more negative. If it read +3dBm, the power measured would be 2mw and that would be a gain from our reference (0dBm) which we know is incorrect – passive cable plants are not fiber amplifiers. As the fiber is stressed, inducing loss, the power level goes from -20.0 dBm to --22.3 dBm.That's a more negative number. But if you are a manufacturer of fiber optic test instruments that offers optical power meters and sources to test loss, why would this confuse you? Perhaps we should blame accounting. Suppose you have a company that has $1million in sales and $900,000 in expenses. What’s the profit? It’s $1,000,000 - $900,000 = $100,000. That’s a profit, right? But suppose your company has $1million in sales and $1,100,000 in expenses. What’s the bottom line? It’s $1,000,000 - $1,100,000 = - $100,000. Wait a minute, that is a negative number – that’s not a profit, it’s a loss. So in accounting, profits are positive numbers and losses are negative numbers when we do the math, but when we talk about loss, we don’t say we have a loss of “-$100,000,” we just have we have a loss of $100,000. Then we’ll put that number in parentheses when we publish our P&L like this ($100,000) and hope it doesn’t get noticed by investors, but you know it will. 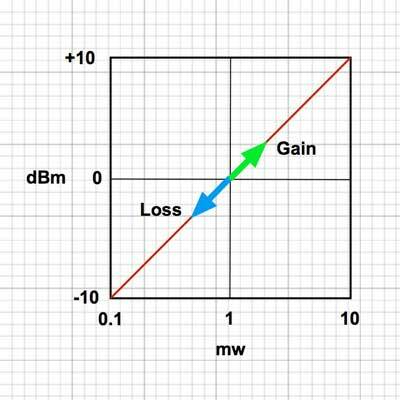 Loss and gain in fiber optic measurements are similar. If you are using a separate source and power meter, loss will be a negative number and gain will be a positive number. But because of convention, we sometimes drop the signs when we report the values because loss always means the optical power measurement was negative and gain means the optical power measurement was positive. But maybe that’s not what the convention has evolved to. Optical loss test sets (OLTS) aren’t designed to measure and display optical power, just loss. The actual power measured is lost in the algorithms used for calculating loss based on the “0dB” reference power and the measured loss. Long ago, most OLTS measured loss and displayed it as a negative number, but some companies who got into the fiber optic test equipment business from other test businesses arbitrarily decided to display loss as a positive number, and today most OLTS do show loss as a positive number. But when the instrument sees a gain, which it can do if improperly used, it therefore displays a negative number, which can be very confusing to a trained fiber tech who understands fiber optic power and loss measurements. OTDRs do the same thing. I looked at traces from a half-dozen OTDRs and all showed loss as a positive number and gain as a negative number. And yes, when you have a gainer in one direction, they show it as a negative number. Telling them that is wrong will fall on deaf ears, I’m afraid. The same article/blog post goes on to discuss optical return loss and reflectance, which has similar issues but they get it more or less right, which is confusing. Why can they understand that more negative numbers for reflectance means lower power in the reflectance but claim the opposite for insertion loss? The “less right” is that with most OTDRs reflectance of an event and optical return loss (ORL) are not the same thing. 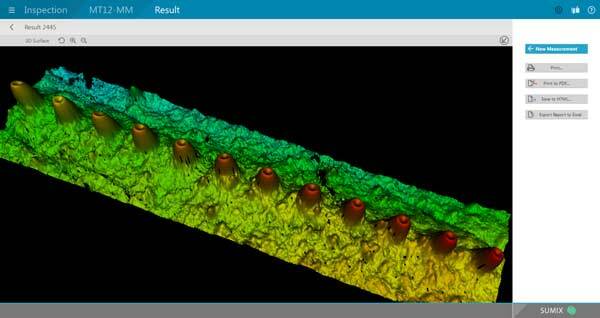 ORL is the summation of all reflectance events and fiber backscatter from the entire length of fiber. And, please, please stop saying “back reflection;” a reflection always goes back toward the source so the term is redundant and was dropped from fiber optics years ago. ** If you want to calculate this yourself, FOA has a XLS spreadsheet you can download that will calculate the equations for optical power for you. The FOA has an explanation of dB on our online Guide and a couple of graphics that illustrate what happens with loss. 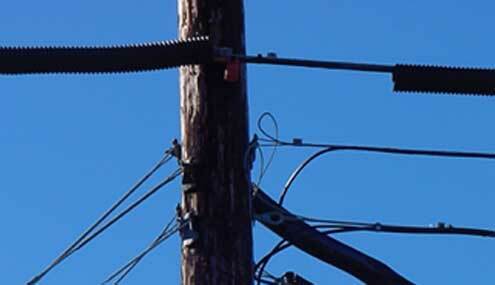 Blasting close to poles with fiber optic cables can depend on the soil between the blasting area and the pole. 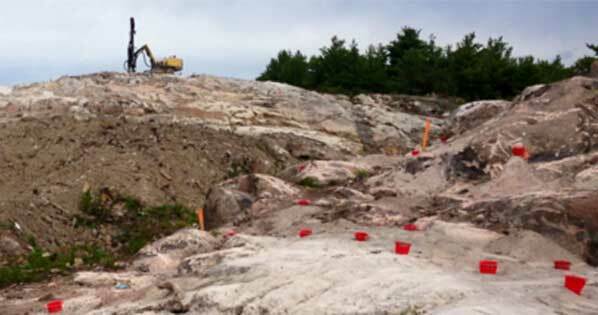 For example: In parts of Ontario there are large areas of solid granite. The pole is generally bracketed to the rock. 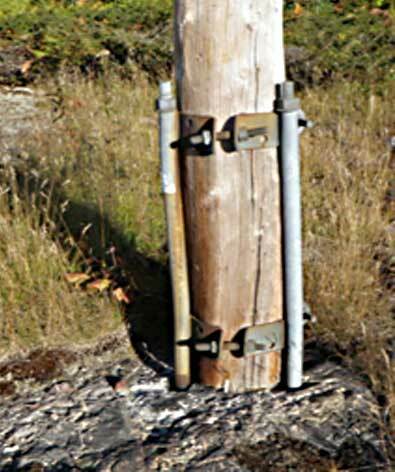 (Some areas have started drilling the rock) there is a solid connection from the blast hole to the pole, up the pole onto the bracket and to the Fiber Optic cable, which they seem to forget is glass. 1.) Cover the aerial cable with Big O (4” perforated drain pipe slit along the length) as shown in the photo above. This protects only from flying rock. 2.) Removing the cable from the pole clamp and hanging it from the bracket with a Bungie strap. Blasting locations are carefully engineered… however, if the crew wants to get home early on Friday and they double up on the blasting the damage risk increases substantially. ( The red cups in the photo are blast holes.) Most companies are wary enough not to guarantee “no glass damage”. This area is almost all solid granite. Regardless of Kinder Morgan’s recommendation, I suggest 5-6 meters separation is not adequate and should be at least 12 to 15 meters. 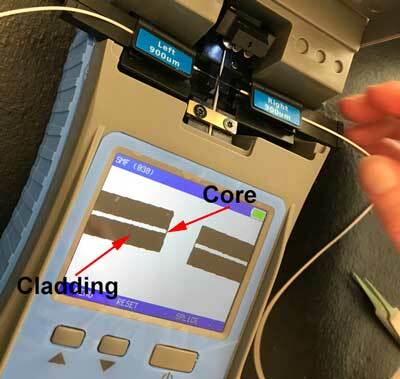 We recently got this email from a student with field experience taking a fiber optic class:""The instructors are telling us that we are stripping the cladding from the core when prepping to cleave MM and SM fiber. I learned from Lenny Lightwave years ago, this is not correct. I do not want to embarrass them, but I don't want my fellow techs to look foolish when we graduate from this course." EVERY fiber drawing we found on the Internet search with one exception (which we will show in a second) showed the same thing - the core of the fiber separate sticking out of the cladding and the cladding sticking out of the primary buffer coating. Those drawings are not all from websites that you might expect some technical inaccuracies, several were from fiber or other fiber optic component manufacturers and one was from a company specializing in highly technical fiber research equipment. The only drawing we found that does not show the core separate from the cladding was, no surprise, on the FOA Guide page on optical fiber. No wonder everyone is confused. 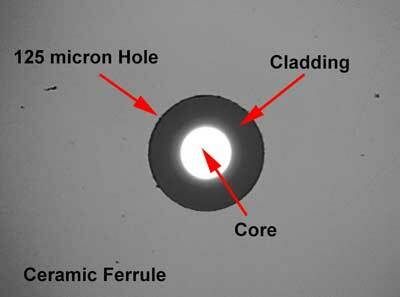 Practically every drawing shows the core and cladding being separate elements in an optical fiber. So how did FOA help this student explain the facts to his instructors? We thought about talking about how fiber is manufactured by drawing fiber from a solid glass preform with the same index profile as the final fiber. But we figured a simpler way to explain the fiber core and cladding is one solid piece of glass was to look at a completed connector or a fusion splice. 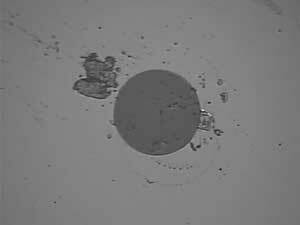 We started with a video microscope view of the end of a connector being inspected for cleaning. Here you can see the fiber in the ceramic ferrule. The hole of the connector is ~125 microns diameter (usually a micron or two bigger to allow the fiber to fit in the ferrule with some adhesive easily.) The illuminated core shows how the cladding traps light in the core but carries little or no light itself. This does not look like the cladding was stripped, does it? Here is the same view with a singlemode fiber at higher magnification. 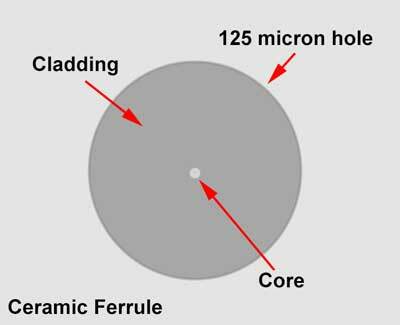 And no connector ferrules have 50, 62.5 or 9 micron holes so that just the core would fit in the ferrule, do they? What about stripping fiber for fusion splicing. Here is the view of fiber in an EasySplicer ready to splice. What do you see in the EasySplicer screen? Isn't that the core in the middle and the cladding around it? In fact, isn't this a "cladding alignment" splicer? We rest our case. If that's not sufficient to convince everyone that you do not strip the cladding when preparing fiber for termination or splicing, we're not sure what is. 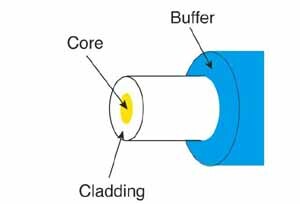 Special Request: To everyone in the fiber optic industry who has a website with a drawing on it that shows the core of optical fiber separate from the cladding, can you please change the drawing or at the very least add a few words to tell readers that in glass optical fiber the core and cladding are all part of one strand of glass and when you strip fiber, you strip the primary buffer coating down to the 125 micron OD of the cladding? Q: Is there a standard that service providers such as ISP, FTTH or cable TV should follow when installing their cables on existing electric poles. For necessary clearances etc. ? A: The location of comms cables is in the “Communications Space.” At the top of the pole is the “Supply Space” for power conductors and between the two is a “Safety Zone Space.” It is There are guidelines of various types, mostly referring to NESC Rule 235. One of the best documents on this is from Nashville Electrical Service. This presentation from Finley Engineering offers a good summary. Q: For overhead installation, can snow shoes, or other service loop devices, hold two separate cables? A: Snowshoes are sized for different cable sizes and types. Some snowshoes are big enough for several cables, that’s no problems. Q: We are working on a project that has miles of underground 7 cell innerduct conduit with existing fiber already running through one of the cells. Is it possible to run electrical conductors through the 2 of the other cells? The conductors would be no larger than 1/0 AWG at 480V or 600V. Both the fiber and the electrical are being installed for the same use. A:We questioned several people in the electrical side that also do fiber work. The opinion is that the electrical may use the other ducts. If the fiber cable has conductive members, e.g. armor, it must be properly grounded. And any cables spliced in manholes need separation and marking. The concern is over what happens with a dig up, but as long as the electrical is turned off before restoration begins, there should be no problem. Q:I’m working on some MM fiber and am unsure if I need a fan out kit. Is there a way I can tell if I do? A: Is it 250 micron or 900 micron buffer? Splicing or termination? Loose tube or tight buffer cable? Generally loose tube cable with 250 micron fiber needs no fan out kit for splicing - tubes go to splice tray and bare fibers are protected in the tray - but probably needs it to terminate if the fibers are exposed, for eample with SOCs - splice on connectors. Tight buffer - 900 micron fiber - does not need fan out kits. Q: We've got a discussion going in our department about whether an APC connection is required at both ends of an electronics link or just in one spot when trying to control reflection for broadcast equipment. Thoughts/advice? A: It seems you could use APCs on the transmit end to prevent reflectance bothering the laser source, but it would get reflectance from the receiver end, probably not an issue unless you are on short links, like in a data center where the far end reflectance would not be attenuated substantially. If you put the APC at the receiver end, you would still have problems with reflectance at the transmitter end. Perhaps the biggest problem is managing to keep patchcords straight. We’d vote for the simple solution, all APCs, which is what many people are doing today. Alternatively, use the best UPC connectors which have only about 10dB worse performance as long as they are kept clean. Q: Can I test multimode over 1310 wavelength? A: Certainly you can, but why? In fact, multimode fiber has been tested at both 850 nm and 1300 nm for most of its history. Some standards still call for testing at both wavelengths. When network speeds were 100Mb/s or less, sources were LEDs at 850nm used for shorter links - a few hundred meters - and LEDs at 1300nm were used for longer wavelengths, up to 2km for networks like Ethernet, FDDI and ESCON. So multimode fiber became almost exclusively used at 850nm. In standards committees we discussed dropping the requirement for testing at 1300nm, but some argued that since the fiber is more sensitive to stress/bending losses at 1300nm, testing at 1300nm provided information on the stress in the fiber. Once multimode fiber became almost exclusively bend-insensitive fiber, that argument lost validity. While some standards still call for 1300nm testing and many test sets offer 850nm and 1300nm LED sources, it’s probably not worth the time. Q: I was wondering if you have an idea of how accurate the numbers from a fiber datasheet are for the stated backscatter coefficient of the fiber. When looking at these numbers reported on datasheets, they are nice round numbers like -77dB, -82dB etc., which tells me that those aren’t actual measurements. They are more ballpark values. Would you happen to know roughly what sort of accuracy those would have for a given length of fiber? A: We believe is the number is an average from some tests done whenever the fiber was designed and first manufactured and is +/- several dB. Remember it’s not a guaranteed spec like attenuation coefficient which they do measure. Remember it is dependent on the pulse width. Corning in the SMF-28 data sheet quotes the numbers you have for a 1ns pulse width. (https://www.corning.com/media/worldwide/coc/documents/Fiber/SMF-28%20Ultra.pdf). You can probably surmise that 1 ns pulse is hardly a square wave and there will be lots of variations in the integrated power in a 1ns pulse created by different instruments. And who knows how you relate that power to a 5, 10, 20 ns or whatever pulse. This paper by Corning talks about reflectance and backscatter and has some interesting points: https://www.corning.com/media/worldwide/coc/documents/Fiber/RC-%20White%20Papers/WP-General/WP1281_11-2015.pdf. The key is backscatter is inversely proportional to mode field diameter, so small changes in fiber diameter can cause changes in backscatter - and MFD variations of several percent are possible. Q: For overhead installation, can snow shoes, or other service loop devices, hold two separate cables? I imagine the bend radius is a factor. A: Snowshoes come in many sizes and are often sized for holding several cables, for example loops around dome splice closures with 2 cables being spliced. Q: If I have 50 micron test leads for my OLTS and I used them to test a 62.5 micron fiber link what can I expect in terms of results? Will the 50 micron leads give me (generally) higher or lower loss values? A: Yes, you will see higher and or lower loss depending on which way you test. See this page in the FOA Guide on Mismatched Fibers. Pull ADSS Cable In Ducts Underground? Q: Our city is installing a 1.5 mile run, mostly aerial and we want to use ADSS cable. There are two or three road crossings where we want to go underground in conduit installed by directional boring. Can the ADSS cable be dead-ended, brought to the ground, figure-8ed and pulled through conduit then continue the aerial installation? Q: I recently read an article you wrote in April of last year about micro trenching..Currently, I am employed with an underground construction company. Something we have never been involved with is micro trenching and would like to possibly get some equipment and training scheduled in the near future. In saying that, it has seemed to be almost impossible to find numbers on the price per foot. Essentially, I am asking if you have any resources to some up with those numbers or models to maybe use for pricing purposes. A: Microtrenching is becoming another tool that contractors are adopting because like directional boring is is less disruptive than regular underground construction. I’m working with one group that’s using microtrenching in CA cities, installing microducts and a 288 fiber about the size of a #2 pencil. Cost is difficult to generalize other than “more than aerial and less than trenching.” Cost is very dependent on where you are working and what the local geography looks like. We know one contractor who claimed to do 5 miles a day in rural Washington at costs near that of aerial. It’s especially good in areas with lots of base stone where trenching or boring is near impossible or cluttered utilities downtown. Ditch Witch sells equipment for trenching and trains users. Condux has the equipment for blown cable and offers training several times a year. Q: We have old multimode fiber and we are still connecting more equipment to it over greater distances and need some way to insure the equipment will work. A: I do not know of any simple formula for figuring this out. Last time I remember such a formula from around 2000 done for Gigabit Ethernet with VCSELs and the equation reminded me of the quantum mechanics course I took in physics. The problem is you have two bandwidth factors, modal dispersion and chromatic dispersion. Modal dispersion is highly dependent on mode fill, e.g. the metric “encircled flux” was developed to define the mode fill of multimode fiber with VCSEL sources for simulations to estimate bandwidth. Chromatic dispersion is dependent on the fiber spec and the spectral width of the source which is better with lasers and LEDs. Can A Fiber Optic Cable Catch "Fire"
Q: While working on a cut-over of a dwdm circuit something has happened that I am now looking for an explanation. A transmission fiber emitted "fire" on that same fiber! We did not see any optical light we saw fire. About 5 cm of fiber burned and remained smoke. What phenomenon occurred? Are the dwdm amplifiers so powerful enough to generate fire? Unfortunately I could not get into the station to take the model of the equipment. A: We’ve heard of high power WDM systems exploding dirt of the endface of fiber connectors and damaging them, but this is a new one. We contacted several technical people in fiber companies and found that this can happen if there was a crack in the fiber in the cable near the connector or lots of reflection perhaps caused by a very dirty connector that allowed the very high power to heat the cable enough for combustion. DWDM with many multiplexed signals and a fiber amplifier creates a lot of power confined to a very small core of the singlemode fiber. 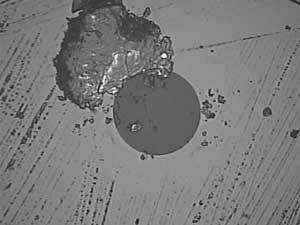 That power can ignite the acrylate coating on the fiber. Q: I'm installing an aerial run of ADSS cable and wonder if I can pull the cable under roads in duct installed by directional boring without splicing when I need to go underground. A: Yes you can pull ADSS cable in ducts installed by directional boring without splicing. Just install the ADSS cable link to the pole where you need to go underground and "dead end" it at that pole. Drop the cable down, "figure-8" the cable to prepare for the pull, then pull the cable in the duct. If you go aerial on the other side, just continue the ADSS installation procedures. Q: I have a technical question about reflective events. I recently assisted to troubleshoot an intermittent SM fiber link for a customer. The cable was dug up a few years ago and a fiber contractor has (fusion spiced) a different chunk of cable into the link to repair it. When troubleshooting the link, I checked the cable with the otdr. I found that each of the 12 fibers had a reflective event at the fusion splice. This was only at the splice tube closest to me. The other fusion splices in the other tube were virtually invisible (as they should be). I'm a little puzzled as to why there are reflections at the fusion splices. I did a little research, but couldn't come up with a good answer as to what is a possible cause of the reflections. (The OTDR also showed a lot of ghosting on every fiber tested) (in some cases it recorded over 40 ghost events) Although I haven't been able to confirm that there is high Bit error rate due to the transceiver not providing these statistics, (except for 3 out of 10 pings fail) I am suspecting that High reflectance is possibly the cause of their unreliable fiber link. A: Reflectance is a big problem in SM links, especially short links. If you are seeing lots of ghosts, I suspect the link is very short. Fusion splices can have reflectance if the splicer is improperly set and the fusion is incomplete or has bubbles. Those splices should have not only have reflectance but higher loss. The solution is to open up the closure, use a VFL to find the reflective events and redo the splices. Q: We have a project where blasting is planned near fiber optic cables. We find no standards for this. Is it safe for the fiber or should we treat it like other utilities like gas and water? A: FOA recommends considering fiber optic cables to be similar to gas lines when blasting nearby. We know of no standards for this but there are some descriptions of projects requiring blasting near fiber optic cable installations. Here is a pipeline company's guidelines for blasting. The guidelines seems to focus on staying 5m from the fiber optic cable and using careful blasting techniques. Q:How do you clean LC Fiber Optic end caps (the cap that covers the cleaned fiber cable)? 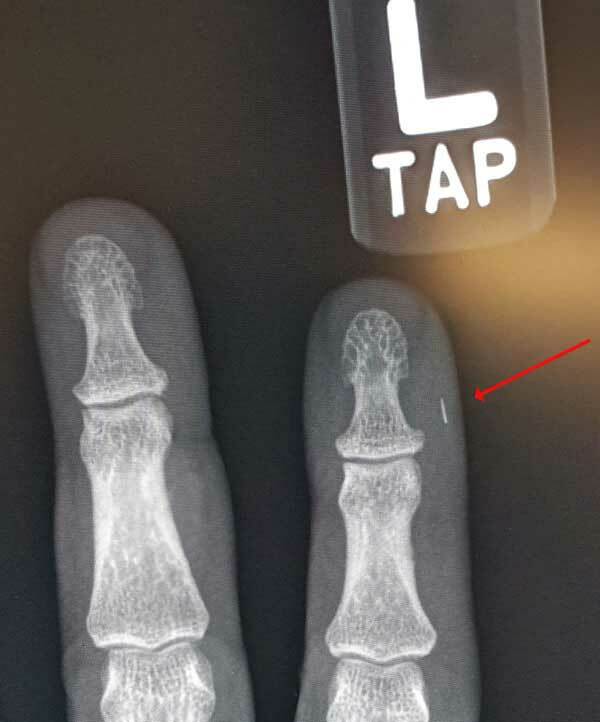 Is there a tool for that? A: We assume you are talking about the small plastic protective caps on the connector ferrule. There is a joke in the industry that goes “there’s a reason they call them "dust caps’” they’re often full of dust.” The problem is these are plastic molded parts that are made by the billions for various purposes - some just fit fiber optic connectors. They come out of the molding machine and are dumped in barrels. No provision is made to keep them clean, plus they will have some mold release chemicals inside them that can attract or hold dust. Even static electricity is a problem. We know no way to clean them nor to keep them clean. We recommend using them to protect the connector ferrule - in fact we’re trying to get people to call them “protective caps” - but after they are removed and before use (connecting to another cable or a transceiver or testing them) they need inspection and cleaning. Q: I have a customer that is splicing a fiber distribution hub to their fiber plant. The fiber distribution hub utilizes 100FT long fiber stubs of SMF G.657.A1 and the fiber plant uses SMF G.654.D. The project has a contract fusion splice passing spec of 0.2dB loss, averaged bi-directional and also a one-way <0.3dB loss (either direction) specification; using an OTDR for measurements. From my research, if the splices OTDR’s test results for the 2 directions are -0.2dB / +0.6 (average of +0.2), the network is not actually seeing a +0.6dB loss; but this is how the OTDR interprets the backscatter information… the OTDR being somewhat confused due to the bend insensitive fiber characteristics. A: Correct - the directional differences are due to the mode field diameter variations in the two fibers. G.654 is a large MFD fiber, ~12.5microns, compared to ~9 microns for G.657.A fiber. The OTDR measures based on backscatter which will be very different for the two fibers. Q: I have a general question about above ground markers for fiber optic cable in conduit. Is there a recommended spacing for the markers? Is there a standard to reference for this? So I might add to line of sight any crossings of roadways, rail ways and some markers for bridge crossings. We have a new section on the FOA Guide: Outside Plant Fiber Optic Cable Plant Construction that may be useful. Q: Help me understand measuring reflection little better. Why do we consider -55dB to be a better reading than, say, -25dB? If reflection and return loss are inverse readings and we had a 55dB return loss, would that positive reading for return loss be considered good? If we have 1/1000 of the light reflected, the reflectance would be -30 dB (1/1000 = -30 dB) but the return loss would be 30dB since it is defined as 1000/1, the inverse, and is described as +30 dB. Likewise, an APC connector would have a reflectance of -50 dB or a return loss of 50 dB. However, return loss as tested by all OTDRs is not be the reflection from a single event but the total of all reflectance events plus total backscatter from the length of fiber being tested in the trace. This is where most people are confused and misuse the terms. Q: We have a contract where we are required to test assemblies that vary from 0.5m to 800m in length with connectors of either PC to Expanded beam or expanded beam to expanded beam type. We currently have a back reflection ‘power meter’ on loan but have been told that the results for assemblies above 5m lengths may not be reliable to measure the connector termination due to the nature of the expanded beam termination and cumulative scatter reflection in the cable. Therefore we are considering OTDR equipment for our back reflection testing but trials we have done so far show that the ‘standard’ OTDR testers are not able to separate events that occur within a 1 – 2m length so we are not able to separate connections on short lengths. We are coming to the conclusion that we will now need to purchase both a back reflection meter and OTDR to cover the 0.5m to 800m range but would appreciate any industry knowledge we can find. A: We took some time to try to research measuring reflectance on expanded beam connectors and was surprised how little I could find. FOA has a web page summarizing reflectance testing (http://thefoa.org/tech/ref/testing/test/reflectance.html) and a full chapter in our book on testing (http://thefoa.org/FOArgTest.html) but I don’t remember ever being asked about reflectance on expanded beam connectors. The best information I have found indicates that reflectance is fairly high because of all of the optical surfaces. It’s possible to test all the cables - short to long - by using a mandrel wrap attenuator after the connectors under test. But if these are multi-pin connectors with multi-fiber cables, that won’t work. I believe there are others like this also. Having both types of instruments is problematic, as the readings will not agree between the two measurement methods. I suggest using the Luciol instrument with the concurrence of your customer so the tests can be comparable. Otherwise, I would not be surprised at 3-5 dB differences or more. What's The Lifetime Of Fiber? Q: "The utility I work for has some FO cable installed, some 20 years+ and I am wondering what is industry standard for the useful life of a cable? This is from an asset management point of view. I realize that FO cables can and do last for decades, especially if the work on them is minimized (ie. splicing for repair or relocation), but what would you consider a good book value for useful life?" A: Cable manufacturers have generally made fiber optic cable for a lifetime of 20+ years and in the last decade or so we’ve been told that 40 years is reasonable for a cable. But that means the cable will retain its specifications for that time frame. Networks, however, do not stand still. In the last 20 years, network speeds have increased by up to 100 times. In the same time period, the fiber has been engineered to accommodate longer and faster links. 20+ year old fiber was installed when speeds were around 1Gb/s, where dispersion was not an issue, nor was dense wavelength division multiplexing (DWDM) being widely deployed. So if you are using fiber at lower speeds, the current cables are probably fine. You might have trouble splicing older fibers in closures because the exposed fibers do tend to get brittle. Terminate All Fibers Or Just Some? Q:We are currently running fiber which will be 12/24, my question is do we need to terminate every pair even if we aren't going to be using them or is there an alternative? A: No you do not need to terminate all of them and leaving some bare fibers is often done when there is no planned use for the fibers or to save money. However, there are some other issues to consider. You do need some spare fibers ready to use, either in case of problems or for upgrades. For small fiber counts, the cost of terminating them all at once will be cheaper than having to come back to the site and doing it in the future. The economics are quite different if you have 144 or more fibers, of course. If you leave bare fibers, be sure to leave enough length to terminate or splice later - about a meter for termination and 2m for splicing. And protect them from damage so they can be used in the future. Q: I know user who want to send their OTDR’s in for calibration, especially those that do government work. Are you aware of a check list of the required tests to comply to what would amount to an “OTDR Calibration”? A: ORDR calibration is covered on FOA Guide page on OTDR FAQs - OTDR calibration is a unsolved problem. I was first involved with it at NBS in Boulder (now NIST) in the mid to late 1980s. They could not justify having a set of “golden fibers” to send around because they could not figure out how to make a “better" OTDR to use as a standard as we/they did on fiber optic power meter calibration. Later some tried building electronic calibrators that could calibrate the timebase and linearity of the receiver, but that ignored the laser transmitter - you would need to calibrate it’s wavelength also. Wavelength variation could cause up to 3% difference in backscatter and loss measurements alone. Then the OTDR allows for changing the index of refraction to different fibers which affects length measures. At one time some manufacturers looked at OTDR cal systems but the only electronic cal units for OTDRs I know that made production came from Belarus. There is a single system in the Navy at Corona, CA however. Bottom line, test it’s operation according to manufacturer's spec. Q; I am performing OTDR testing using 3 different wavelengths (1310, 1550, and 1625) on the same fiber but I get 3 different results for fiber length. The test set and testing parameters do not change. A: The OTDR calculates length by measuring the transit time to an event (half the total time since it measures the pulse time both down and back) and multiplies it by the speed of light in the fiber. Speed = C(speed of. Light in a vacuum) divided by N(the index of refraction of the glass). Most fibers have an N~1.46. In an OTDR that speed of light is set using index of refraction in the setup parameters. In the fiber, the light actually travels at different speeds according to the wavelength of light - that is what causes chromatic dispersion. For Corning SMF -28 SM fiber, effective refractive index at 1310nm is 1.4674, and at 1550nm is 1.4679, not much difference but adds up at 10km or more. So your OTDR probably has the wrong setup. Q: I am looking for a standard that describes the value of parameters (IL, RL) and class (if we can talk about class) for FO mating adapters. A: Mating adapters are part of the connection but like each connector they only contribute to the total loss of the connection and cannot be separated from the other two when talking about loss. They can be specified by mechanical dimensions and materials. 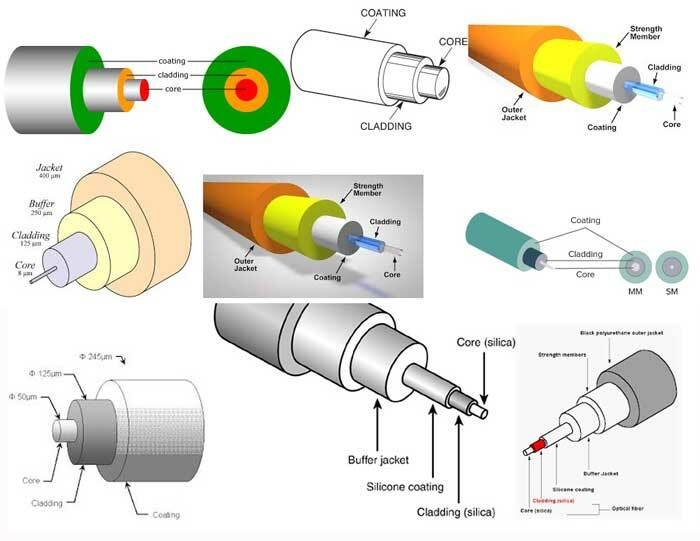 For example on 2.5mm ferrule connectors (SC, ST, FC and the obsolete FDDI and ESCON duplex connectors) the mating adapters have had alignment sleeves made of molded glass-filled thermoplastic, phosphor-bronze and ceramic. The plastic ones are cheap but wear out quickly - 10 insertions will leave plastic dust all over the mating connectors. Phosphor-bronze mating adapters last longer - maybe 500 cycles. The ceramic sleeve ones last almost indefinitely. We know this because we were in the test equipment business for 20 years (we started FOTEC in 1980 and sold it to Fluke in 2000) and we tested these mating adapters for longevity with reference test cables used in insertion loss testing. We had many calls from techs with problems caused by the adapters with plastic sleeves. So the way we know the mating adapters are graded is by alignment sleeve materials. Q: I have several 1000 feet of old 62.5/125 armored fiber optic trunks under a raised floor that I am replacing/upgrading to 50u MM and SM trunks. Is there any guidance on ‘Best Practices’ to follow when cutting these trunks into more manageable lengths for removal? A: Use a jaws-type cutter to cut the cable into reasonable lengths and remove it. There should be no danger in cutting the cable up as long as your workers only cut the right cable. Raised floors often have large numbers of cables - often including power cables - so its important to ensure the proper cables are being cut an removed. Q: With a fiber optic pathway that has multiple patching points...if the end user requires APC connections, isn't it only important to have those angled connectors at the end/equipment connections with UPC being acceptable throughout the middle part of the link? A: Reflectance at the connection is the issue, of course. Reflectance near a transmitter can affect the laser transmitter causing nonlinearities or noise in the device. That’s always been a major concern. The second issue is reflectance causing background noise in the link. If you have ever seen a ghost on an OTDR, you have seen a reflectance at a connection that is bouncing back and forth in the fiber and is of high enough amplitude that you can see it at the source. Of course if it reflects back and forth in the fiber link, it will also show up at the receiver end, becoming noise and/or distorting the receiver pulses. In a bidirectional single-fiber network like a PON, it affects receivers at both ends. Some refer to this as multipath interference. It is being studied by international standards groups but nothing has been published on it as far as I know. With that background, I would answer you question this way. APC connections at each end of the link will effectively stop any reflectance issues going back and forth in the whole link. Using UPC or PC connectors in the link with reflectance better than -40dB are unlikely to cause problems. (Keep them clean of course since dirty connectors show high reflectance.) If the links are very short (<1km), the fiber will not attenuate any reflectance substantially, so short SM links (FTTH and passive OLANS for example) often use APC connectors everywhere. What Do Testing Results Indicate? Q: I was told the other day by a network technician that it is possible that a fiber optic strand that is tested to standard, 850, 1300, mm and 1310-1500 SM bi-directional can pass a test but when connected to an optic it doesn’t work. I told him that the optic is the variable but if a strand passes the testing its qualified to “work” or pass light. A: There are several reasons it can be true. -The installed cable plant is OK but the patchcords are bad. Or mixed up - we know instances where systems did not work because MM systems were connected with SM patchcords and vice versa - instant 17-20dB loss. -The polarity is wrong so the transmitter does not go to the proper receiver. For MPO networks, this is a major problem since there are so many different polarities used. (See MPO array/parallel connectors and how to test them). This is often a documentation problem. -Post testing, the connectors get contaminated and not cleaned or are damaged. -Mixing PC and APC connectors. Bad for loss - may cause serious damage too. A: TIA 568 has included a connector loss of 0.75dB for decades. Even the committee is aware that this is a bogus number for most connectors but they leave it in because the manufacturers of MPO connectors need it to comply with the standard. SC connections should be ~0.2-0.3dB if the connectors are good and properly cleaned. Now in the patch panel you describe, each of the two connections should be in that range for a total loss of 0.2-0.6dB. TIA would allow 0.75dB for each connection or 1.5dB total. Q: What is the difference between OM3 and OM4 type fibers and G.654/G.655? They seem to be rated for the same amount of GBs (10-400) and the only difference seems to be the multi-mode nature of OM3/4 vs. the single mode nature of G.654/655. Can they both be used in long haul communications if laser optimized? A: OM3 and OM4 fibers are both 50/125 micron fiber but have different bandwidth capability. OM3 is rated at 1500MHz-km while OM4 is rated 3500 MHz-km. OM4 is an evolution of OM3 where design and manufacture allow more bandwidth. More bandwidth translates into slightly longer link lengths in faster networks, ~1-10Gb/s. For example, Ethernet at 10Gb/s will go 300m on OM# and 450m on OM4, which can be important if it is being chosen for a enterprise network backbone. The differences in G.654 and G.655 are more complicated. G.654 is singlemode fiber optimized for use at 1550nm for long distance use. G.655 is “non-zero dispersion shifted” fiber tweaked for dense wavelength division multiplexing (DWDM) to prevent secondary problems with high power and closely spaced wavelengths of DWDM and fiber amplification. It’s the kind of fiber used in long submarine cables. 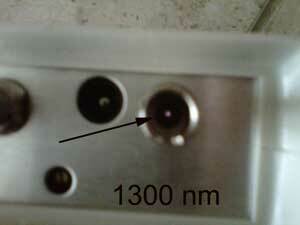 Q: I am working on calibration of an optical power meter. It is an old Photodyne 2285XQ and I need to test it at 820nm, I believe this wavelength is (or used to be) fairly common in military applications. The problem is the only equipment I have available is all based around 850nm/1310nm/1550nm. Our optical power meters and optical spectrum analyser can certainly operate at 820nm, but I’m having real difficulty finding a commercially available light source at 820nm. A: That Photodyne meter was probably built before the US National Bureau of Standards agreed around 1983 to create the first calibration standards for fiber optic power meters. NBS created standards for the three primary wavelengths of fiber optics - 850, 1300 and 1550nm - based on the available laser wavelengths for calibration with their standard ECPR - electrically calibrated pyroelectric radiometer. The 850nm range was never considered a problem because in the early days LEDs were sometimes called 820nm and sometimes called 850nm, but the spectral width is quite wide and the variation in actual peak wavelength, even as called out in standards, is 850+/-30nm or 850+/-20nm, making it a very “broad” standard. I know the rules for MIL standards and calibration so here are several solutions. Your solution will require a transfer from some transfer standard power meter. 1. Use the 820nm laser and calibrate the output with the H-P set at 820 if that is possible. Possible error due to calibrating only a small spot on the Photodyne detector. 2. 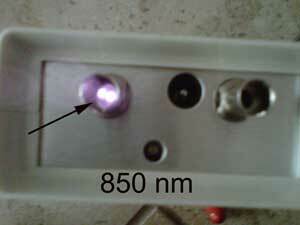 You can also make the cal above with a high-intensity source with a filter around 820nm. 3. Use an 850 LED and calibrate the output with the H-P set at 820 if that is possible. This assumes the photodetector sensitivity curves are similar. Q: We were sent this OTDR trace and asked why some traces showed negative loss - gains. A: The issue with this OTDR test of a factory-manufactured patchcord was not straightforward. To summarize, the patchcord was plugged directly into the OTDR port, with no launch cable. The OTDR has no reference for measuring the loss of the first connector on the cable nor the second connector since neither launch or receive cables were used. Without a launch cable, the OTDR is trying to get information from the connection to the instrument itself which is basically impossible since it’s suffering from overload caused by the test pulse - even with APC connectors. The OTDR (Yokogawa) is one of the cleanest OTDRs at the interface (we have one on loan at FOA right now) but it’s still not designed to measure that loss. Furthermore, using the instrument interface to plug in every connector will wear that connector in the unit out quickly and require servicing by the factory. The second issue is the difficulty of measuring on short cables like this. Note the vertical digital resolution of the display and think about the location of the second marker - it’s measured dB value will jump around as it goes from digital segment to the next digital segment. When you use a launch cable and measure the loss of the connectors using the “4-point” measurement - also called “least squares approximation” in the FOA Guide to OTDRs. That will overcome the digitization errors as well as the settling times of the pulses. Q: I would like to know if there is information on your website that explains "POTS OVER FIBER"? A: POTS - the acronym for “plain old telephone service” - is digitized to transmit over fiber. In the early days (late 70s and 80s) it was simply T-carrier with a fiber converter. By the end of hte 80s it was ATM and SONET. More recently, it’s all going to carrier Ethernet since 99%+ of the traffic is data not voice or PONs (passive optical networks) for fiber to the home. Q; I have a questions about the re-routing of fiber optic lines that have been in place for a number of years. Is it a standard transaction in the fiber optic business to have to re-route fiber that has been in service for a long period of time. (e.g. >20 years) If so, is there a best practice for removal from conduit for re-rerouting? A; There is no way we would recommend removing and reinstalling 20-year old fiber cable. First of all, old cable may be damaged in removal. Then cable and fiber technology has improved over the years so you can get much better components today at greatly lower prices. (One industry analyst I know likes to say that fiber is cheaper than kite string and fishing line!) Today’s cable designs allow for much smaller cables with many more fibers (288 fibers in 9.7mm - just over 3/8”) and new conduit designs allow for more cables in a conduit (microducts and cloth ducts) and easier installation - blowing in cables and microtrenching are perfect for metro areas. More fibers, especially in a big city, is a must. Smart cities, small cells, FTTH (fiber to the home), ITS (intelligent traffic systems), V2X (vehicle to vehicle, infrastructure, etc.) and many other services need lots of fibers. Our recommendation is to pull it out and dump it. Install new ducts and the fiber you need (x10 maybe?) and have new ducts for future use. Are you familiar with “Dig Once”? Q: We need to test a fibre link terminated with APC SC pigtails. I am using SC-APC Ref Leads to interface the LSPM to the fibre link. I am using the 1 Test Cord Method. Step 1 means connecting the LS to the PM via one Ref Lead. That means I have an APC Green SC connector plugged into the PM. Is that OK? A:The SC APC connector should only be mated to another SC APC connector to prevent potential damage to the fiber/ferrule end. But most power meters have adapters for the connector that have an air gap above the detector to prevent contact to the detector window. Plus, the detector should be large enough to capture the light from the SM fiber exiting at a small angle. Thus you can plug the connector into the power meter directly. Some meter manufacturers make SC APC adapters for their power meters that angle the connector toward the detector but that is generally not necessary unless the meter has a very small detector. However if the power meter has a pigtailed detector - that is the meter has a fiber>fiber interface, you will need to add an adapter patchcord to mate the APC connector to it. When you set a 0dB loss reference all those connections will be zeroed out. Q: I have taught for several institutions and throughout all my years of doing this I was always taught that when testing for insertion loss and back reflection for singlemode cable links that testing bi-directional is an imperative. Recently when I was attending a meeting involving members of the military along with folks involved in the development of the military manuals, it was mentioned that with singlemode testing that bi-directional testing is not necessary. A; First of all, there is a directional difference in splice or connector loss - and maybe reflectance (that term is now almost universally used in place of “back reflectance” which is a poor term since a reflection is always back) - as long as two different fibers are being spliced. Fiber geometry is the main difference - mode field diameter in SM and core diameter in MM - but it can also be a matter of the fiber composition.This happens if two different manufacturers’ fibers are joined or bend-insensitive (BI) fiber with differences in depresssed cladding geometry are joined. If you test bidirectionally with sufficient accuracy, you can see the difference. It’s an OTDR trace that most people are familiar with - if you see a gainer, you shoot the other direction and average to get the “actual” splice loss. When splicing or connecting different types or manufacturers SM fiber you may see directional differences of up to 0.3dB or more. Same for MM, not only for differences in core diameter but also for connecting BI to non-BI fibers. While those OTDR measurements are actually differences in backscatter levels, they are indicative of real differences in connector loss or splice loss in opposite directions. Are those differences enough to be of concern? That’s a judgment call. We’ve found most people do their bidirectional testing all wrong. With an OTDR, you should disconnect the instrument, not your launch and receive cables, and take just the instrument to the other end. Disconnecting the launch and receive cables changes the fibers at the connections to the cable under test and you lose the connection you want to test from the opposite direction. Bidirectional testing with a test source and power meter is more confusing. You have to do your “0 dB” reference, check the launch and receive reference cables, measure the cable under test, then move just the source and meter to the other end, test the cable under test again, then disconnect and then measure the output of the source to get the “0 dB” reference used in that direction. That’s confusing! Even if you do test bidirectionally, you do not get the “actual” connection or splice loss like everybody says - you get the average of the two directions. Unless you are willing to do a lab setup and some careful testing, that’s the best you can do. Now we are into measurement uncertainty. If the measurement uncertainty is around the same as the typical bidirectional difference, does bidirectional testing gain you that much? The new FOA book on testing goes into this - a complete chapter is devoted to measurement uncertainty. Q: Should testing of the fiber plant be done before the Optical Network Terminal is installed? A: Fiber optic testing is generally done when the cable plant is installed to confirm proper installation and check that the performance is adquate for the electronics planned for use on it. Test installed cable when splicing - check the fusion splicer estimate of loss and do OTDR testing if questionable and inspect every connector as termination is done to confirm the connector is good. Test cable plant after splicing and termination - end-to-end insertion loss and OTDR testing for longer OSP (outside plant) links. New singlemode cable plants for high speeds may need "fiber characterization” - adding in CD (chromatic dispersion), PMD (polarization mode dispersion) and SA (spectral attenuation for DWDM wavelengths) testing. If one is considering upgrading a cable plant that is already installed or has been used, these same tests should be done - inspection/cleaning, insertion loss, OTDR. When the system is installed, one should know it should work because of the testing done during installation. One should inspect and clean patchcords before installation and test them if suspect. In fact any connector needs inspection/cleaning before hooking up equipment. Dirt is the biggest problem with fiber optic systems. Q: What is the difference between singlemode and multimode bulkhead/adapters (mating adapters). My understanding is you cannot use the singlemode with the multimode and visa versa. A: There are 3 types of adapters - rated for SM or MM - based on the alignment sleeve material. -Ceramic alignment sleeves are the best and most expensive. They are very precise in alignment and last for a long time. Recommended for all singlemode and all testing purposes. Don’t use MM adapters for SM but SM adapters are OK for MM. Q: What is the reason for wrapping the cable in a figure eight? A: When you need to do an intermediate pull, you have to pull the fiber and coil it on the ground. A simple coil will put a twist in the cable. Figure-8 coils put in twists of opposite directions on each side of the 8 making for no overall twist in the cable. See How To "Figure 8" Cable For Intermediate Pulls in the FOA Online Guide. Can I Build A GPON Network With "Taps"? Q: Can I build a GPON network where I do a drop to one subscriber then continue to the next subscriber for another drop and so on? A: There have been examples of this type of “tap” drop proposed, for example in rural areas for drops to widespread subscribers on a longer network than is typical for FTTH. It’s just a version of a cascaded splitter network. with taps that just do a 2 way split. The taps used are typically 90/10 taps, where 10% of the power is tapped off for the drop. There are some important issues to consider - Since you are dropping 10% of the power at each tap, you are limited by how many drops you can have. If you calculate the loss budget - after the first tap, you have 90% power left less the excess loss of the splitter (~0.3-0.5dB). The tap power is down ~10.3 dB and the through power is down ~0.6 dB. At the next tap, you use the same formula plus you add the loss of the fiber to that tap and so on until you reach the GPON limit. It’s a pretty complicated process to design, but you can see that with these power losses you will not get a large number of drops in a GPON network with 28dB max power budget. We did a rough calculation and 20-24 drops may be possible depending on the fiber lengths. This network will probably be much more expensive and more distance limited than simply running a cable with many fibers and dropping fibers from that cable with midspan entry. Couplers are expensive, fiber is cheap. We also do not know the issues with the large differences in transmission times between the first connections and the last ones, which depends on the length of fiber in the systems. That may require some programming at the OLT. Q: We are an automation system integrator in South Africa. We have a client that has multimode 62.5/125 fibre optic plant wide. None of the runs between components are longer than 2km. We intend to upgrade the technology from a proprietary communication protocol to a standard ethernet protocol at 100 MHZ. The fibre to copper convertors we will be using are using 1300nm light source and have a Fibre Optic Link Budget of 12.8dB for 62.5/125 um and 9.8dB for 50/125 um. The client has been advised to replace the multimode 62.5/125 with multimode 50/125 cabling and we need to know if this is really a requirement. A: Do you know how old the fiber is? It should be what we called FDDI grade 62.5/125 fiber with a loss of ~1dB/km and a bandwidth of 500MHz-km at 1300nm. A 2km link should have a loss of 2dB for the fiber and ~0.5dB/connection - well under the power budget of the link. 100Mb/s Ethernet variants were designed for 2km or more on this fiber. There is no reason to upgrade at this time, 50/125 fiber would not be needed until Gigabit Ethernet was desired. Do We Need Repeaters For 30 Mile Link? Q: I need to design a 30 mile (~50km) link. Will regeneration like a fiber amplifier be necessary? A: It depends on the comms equipment but I doubt you need regeneration. 30 miles is 50km, only 10dB of loss for the fiber at 1550nm, maybe 10 splices at <0.1dB adds only 1dB loss and another dB for connectors on each end. I think you probably can find equipment that runs on 12dB loss budget. That said, most new high speed systems (>10G) have 20km versions then go to expensive long haul coherent systems. So talk to the communications equipment manufacturers and see what they say. If you do need a EDFA, they are not that expensive but the site is expensive and requires power (+ backup). See if it’s possible to put the EDFA in the end facilities to get enough power for the whole run. Q: I recently did a CFOT training class for a government agency. They use 200 micron core fiber in short sections (50 ft. the longest) within aircraft. The connectors are SMA 905s. The cable specs state that there is 8dB of loss in 1 km at 850nm. I have searched but cannot find any info regarding how to test the cable/connector links. The OLTS they have uses 62.5/125 jumpers. Is testing these cables with the above OLTS setup at 850 nm a valid testing method? A: That’s 200/240 PCS or HCS fiber - plastic clad silica or hard clad silica step-index fiber - that has a glass core and plastic cladding. It has been used on a lot of platforms because it’s large core makes connection alignment easy. The SMAs are used because the connectors are air gap connections so vibration will not cause scuffing that you can get with PC - physical contact connectors. On aircraft, the 1/4-36 nuts on the SMAs are usually safety-wired too. Testing can be done just like any other cable plant with a double-ended test (OFSTP-14) for the whole cable or a single-ended test (FOTP-171) to check the connection on either end. You need a 850nm LED source and a meter with a large detector (>2mm) to pick up all the light and an adapter for SMA connectors. You also need launch and receive cables of matching fiber and connectors about 2m long. No worries about mode conditioning since the step-index fiber is a mode mixer itself. Fiber attenuation coefficient of 8 dB/km sounds about right. Connection losses ~0.5-1.0 dB are normal. A typical patchcord would have a loss of ~1-2 dB. To get a microscope to view it might be difficult. Q: I have 10 kilometers of singlemode cable installed that was not labeled. It has been suggested that we shoot a VFL down the fiber and label it. I am having trouble finding a VFL that will shoot this far. Any ideas? A: Occasionally we see some imported VFL that claims to go 10km or more. That tells us the company is clueless about fiber optics. VFLs work at ~650nm in the visible red spectrum while SM is optimized for 1300-1600nm in the infrared where it has a loss of ~0.3dB/km. At 10km it has a total loss of ~3dB or half the input signal. At 650nm, singlemode fiber has a loss of ~10dB/km which means it loses 90% of its power per km. At 10km, you have 100dB of loss - leaving you with 0.00000001% of the input power - not much! Q: If we install GPON passive fiber optical LAN in a new hotel, would one need to run fiber to every AP? Since every hotel room needs an AP this gets expensive. Any suggestion on the simplest and less expensive way of connecting Fiber Cable to an AP in the hotel room? You should also check out the APOLAN website (http://www.apolanglobal.org) for more information on hospitality applications with POLs. Q: I am wondering how the landscape will change as the nation moves from 4G-LTE to 5G. Will it use the same network as currently, or will the network need to be updated or replaced? To what extent will 5G be dependent on wireless vs fibre optic? Will the infrastructure nationally move more toward an underground wired one, rather than a Radio Access Network? A: The wireless network is totally dependent on fiber optics for it’s communications backbone. The “wireless” part is the connection from an antenna to the mobile device. From that point, the network is cabled, mostly fiber already and soon to be all fiber. 4G/LTE and soon 5G in urban areas is moving to “small cells” with about 10X as many cell sites covering much smaller areas. Every small cell site needs a couple of fibers. Metro backbones will require very much larger fiber counts, especially with C-RAN (centralized radio access network) architectures now being implemented. An example is Santa Monic, CA where we live. It has about 200K citizens, 8.9 square miles(about 23 sq km), but has planned for 600 small cell sites, spread over multiple service providers. A 1.5m cable is not a launch cable. A launch cable must be long enough to allow the OTDR to settle down after the test pulse. THe negative loss is because the OTDR has not settled down sufficiently. Generally the minimum launch cable for testing short cables would be 10-20m for MM, 100m for SM. 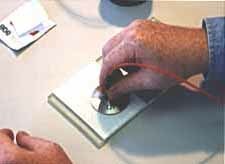 Then use the shortest test pulse, ~1km range, average enough to reduce the noise. Q: I was told a contractor installed arsenic coated fiber optic cable because they didn’t want animals to chew through it. Is this true? A: Some cable has chemicals put in the jacket to make it taste bad to rodents. We have not found any one who claims to use arsenic, in fact, we could find no references to what kinds of chemicals are used. Why Do Cables "Go Bad"? Q: It’s been my observation over ~15 years of building and managing fiber channel storage area networks that from time to time cables will fall out of transmission spec. In terms of communicating with non-storage people, they in essence, “go bad”. Other than possible damage due to physical disruption of a cable, or contamination at the connectors usually caused by a human being unplugging/replacing, has it been your observation that MM cables can “go bad”? A: There are some possible causes of problems over time. We know of connectors that fail for several reasons. The biggest cause is with prepolished/splice connectors with mechanical splices. the assumed problem is the index matching get goes bad, but that’s highly unlikely. It’s usually the crimp fails and the fiber pulls out, especially if it has any stress on the fiber. Adhesive connectors can have a bond between the connector and fiber fail, more likely on anaerobic connectors. Any stress on the fiber at the connector is bad. Patchcords should not be left hanging on racks but dressed into horizontal racks below each patch panel. Residual stress in cables can be a problem - tension or tight bends - and they may get worse over time. Moisture is always a worry. It takes years to show up, but indoor cables are not protected from moisture like OSP cables. Of course, transceivers fail too - electronics are generally very reliable but do deteriorate over time and cause failures. We always say fiber requires no maintenance - set it up right and lock it up. As you pointed out human intervention is often the issue. Fiber Ports Or Media Converters? Q: Should I Buy A Switch With Fiber Ports Or Use Media Converters? A: I’m assuming you are thinking of using a switch with copper Ethernet ports and a media converter instead of a switch with fiber ports. The downside is that it adds complexity and increases the chance of failure. My analogy is something my primary flight instructor told me many years ago - multiengine planes are not safer because having two engines doubles your chance of having an engine failure. IBM still says that most network problems are cabling problems. Using media converters adds more electronics, more power supples and more cabling connections. Q: We're evaluating PON power meters and test sources. How should we test them? Do we need a PON network? 2) make some loss tests of cables and attenuators over the range of 1-5-10-15-20dB and compare to a meter you trust. 3)the extra calibration at 1490 is not an issue - the difference between 1490 and 1550 is very small and providing that calibration can be more a confusion factor since there are no transfer standards for that wavelength. 3) The big issue with sources is stability. Connect the source with a short cable to a trusted power meter, connect it to its power supply, turn it on and monitor the output over time. There should be a short warm-up period and then it should be stable within a few 0.01s dB. Let it run on batteries until the batteries run down to ensure that the source has a proper power supply that keeps the light output stable over time as the batteries discharge. Q: We tested one link of 90.8 km at 1310/1383/1550nm and we got high loss at 1383 while other wave lengths have good results. What's up? Q: Are there different grades (micron) polishing films/papers for multimode and single mode fiber cables in ODF termination ? If yes, What are the grades polishing papers for multimode 50/125 um and 62.5/125 um fibers. A: The polishing of MM and SM fiber is indeed different. Both start with an “air polish” with 12micron alumina polishing film to remove the protruding fiber. Then the polishing continues on a soft polishing pad (3mm 80 durometer rubber). Q: Can I get an indoor armored 8 core fiber optic cable? A: Most cable manufacturers make indoor armored cable using corrugated wrap armor to protect cables from crushing loads from other cables especially in under floor installations. Q: Is there a current standard, for maximum allowable loss, for MPO fiber connectors? If so… what is the standard # from EIA/TIA? (Was it amended in 568B, since they were introduced?) Would it be similar to standard connectors @ 0.75dB Max allowable loss? A: The MPO is covered under the TIA 568 standard. All fiber optic connectors are the same - 0.75dB. There are discussions being held at TIA and ISO/IEC on using a different method of specification, statistical in nature, that says X% would be less than YdB in several stages from 0.1-0.2 to over 1dB, but it’s led to some headed discussions. MPOs for MM are probably no less than 0.5dB and SM are near the 0.75dB mark. At least the SM ones are APC (usual 8 degrees, but still a flat polish). I’ve recently learned that MPOs are polished for fiber protrusion to try to get fiber contact, but the evenness along the line of fibers is harder to control. Q: We're now using SM fibre so it looks like we don't need mandrels in the Ref Lead at the Light Source. The info I have is that we need to make a couple of air coils 35mm to 50mm in diameter. Why? A: When you launch from a pigtial laser source through a connector into a reference cable, you do have several modes being propogated. It usually takes 100m or so for the second or third order modes to attenuate. So the coil causes them to be attenuated by the stress enough to no longer be significant - it’s a mode filter just like MM. If you do not do this, you will measure higher loss in the fiber and at connections near the source. Since most SM has traditionally been long distance, the effect was small or ignorable, but with short links, it can be significant. Followup Q: But how do we explain multiple modes in Single Mode fibre? A: When you get the core of the fiber down to ~5-6 times the wavelength of the light, it no longer acts like geometric optics (like MM fiber). Some of the light can travel outside the core (see the note on “waveguide dispersion”here http://www.thefoa.org/tech/ref/testing/test/CD_PMD.html). At launch, significant amounts of power are at higher angles creating short lived modes that are highly attenuated. Q: Should the testing be done with the same piece of equipment from both ends then merge the results or does that not matter - can you use traces from two OTDRs as long as the test equipment is compatible and settings are adjusted properly. A: Yes, you should use the same test set from each end but this way - take a trace, disconnect the OTDR from the launch cable and go to the far end of the receive cable and connect it there to take the second trace. The usual way people do bi-directional tests is to disconnect the launch cable and take it to the far end and shoot back up, often not using a receive cable at all, figuring they get the far end connector on the second test. But when you disconnect the launch cable (and/or the receive cable) you lose the connection you want to test in the other direction! As for using the same OTDR, every OTDR is different and the results you get may be significantly different, esp. if they are not calibrated recently - and few OTDRs are ever calibrated. Q: Are passive OLANs a good choice for hotels or resorts? A: Passive Optical LANs are enterprise networks based on fiber to the home (FTTH) technology not Ethernet over structured cabling. The FTTH network is usually using GPON standard equipment over one singlemode fiber with passive optical splitters that provides basic Level 1 and 2 network functionality. This is not Ethernet but carries Ethernet over the GPON protocols at 2.5G downstream and 1.25G upstream. For hotels, convention centers and similar facilities, the ease of upgrading to a passive OLAN is a big advantage - one fiber goes from the computer room to a splitter where it can serve 32 switches of 4 ports each. That’s right, one fiber can support 128 users! It can support anything that a network can - wireless access points, security cameras, secure entry systems, VoIP phones or POTS phones - anything that will run over a conventional network. Q: I have a question about the OLTS - do you have to recalibrate it every day ? A: Any optical loss test set needs to be calibrated for “0dB” whenever anything changes - the launch cable - source output - or even every few tests to ensure the connector is clean and undamaged - plus they wear out. 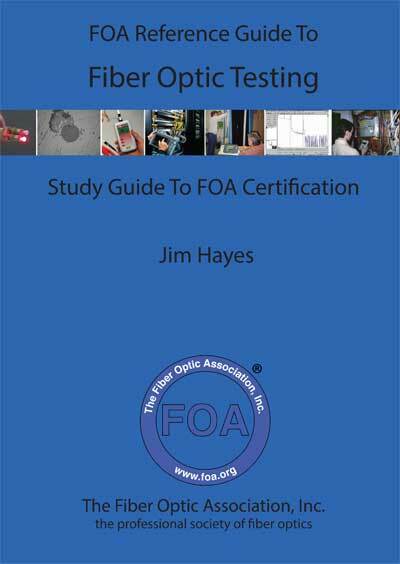 See 5 different Ways To Test Fiber Optic Cables. A: Insertion loss was the term originally used for the loss of a connector tested by a manufacturer. They would set up a source and length of fiber connected to a meter, measure power, insert a pair of connectors and measure the loss. Since it was an inserted connection, it became known as insertion loss. Over time, the term insertion loss became more widely used to contrast with the loss measured by the OTDR, an indirect measurement using backscatter that may not agree with the loss with a light source and power meter. Insertion loss, therefore migrated to meaning a loss measured of a cable or cable plant inserted between the launch and receive cables attached to a light source and power meter for double ended testing used with installed cable plants. For patch cord testing, you do not use a receive cable attached to the power meter but connect it directly to the cable under test, making the test just include the one connection to the launch cable. Two other terms often mixed up are attenuation and loss, which are essentially the same, except when discussing a fiber. In fibers, attenuation is often used instead of attenuation coefficient. Attenuation is the absolute loss i dB while attenuation coefficient is the characteristic attenuation of a fiber expressed in dB/km. Q: We are looking at a company’s fiber network which has been laid at various points in time over numerous years. In this process, we are trying to identify the changes that were made to either/both the glass fiber and the cladding. Are there different generations of what was industry standard in creating the fiber? For example, are you able to identify the difference in a fiber that was laid in 1980 versus one laid today? Was the cladding the same size/thickness etc. in 1980 as it is today or has this been modified/improved upon over the years? In all, we are trying to find what modifications have been over the years and how this may improve the life of the network and its capabilities. A: This is a common problem today. Many network operators are evaluating their fiber networks for upgrades, hampered by the fact that few are properly documented. Below is a timeline that should answer your questions. What many network owners are doing now is testing their cable plants - a process called Fiber Characterization. There are contractors who do this service. 1984 - singlemode fiber becomes feasible, telecom drops multimode fiber, all future installations are singlemode - this first SM fiber with a 9 micron core and 125 micron cladding is still available today but with better specifications. Really early fiber may not have good environmental protection and degrades over time. Early speeds were 145-405Mb/s, up to 810Mb/s by the end of the decade. 1990 - around this time, modern fiber begins - better performance and environmental protection. Fibers for wavelength-division multiplexing in the 1500nm range appear allowing multiple signals on a single fiber and fiber amplifiers allow long spans. 2000-date - massive Internet growth and mobile device growth eats up glut of fiber and demands many times more. Dense wavelength-division multiplexing becomes the norm. Speeds began at 1.2/2.5Gb/s, upped to 10, 40 and are now at 100Gb/s. So most fiber installed after 1990 has the possibility of being used at 10Gb/s, after 2000, it’s probably OK for 40Gb, and since 2010, you are probably OK for 100G and maybe more. To verify performance, you test each fiber for connector condition, loss, spectral attenuation, chromatic dispersion and polarization mode dispersion. There are test sets that will do Fiber Characterization in basically one step. the light from the arc will damage the detectors in the modules at the end (20km-rated SM for us). A: I have never heard of this being a problem. The amount of light coupled into the fiber from the splicing would be very small compared to a properly coupled laser. When a cable is broken you might be splicing the fibers that are live without knowing which are live and not caring. On your newer splicers this is not a problem. On the older splicers with the LID system you would have to reduce the power to get a good splice which they would do by putting a bend in the Fiber. Q: Is true duplex over a single fiber possible, or is more like a shared time-domain technique in a quasi-duplex mode? I would guess that true duplex would lead to interference problems. A. Bidirectional links are widely used - that’s how FTTH PONs work. They use splitters to combine/split the signals and one wavelength downstream and another upstream. See Fiber Optic Datalinks and for FTTH FTTH Architectures. If you have an old cell phone, try it. Our experience is that older cell phone cameras have better sensitivity at IR wavelengths than newer phones, so you may want to toss that old flip phone into the toolbox. Fiber Optic Asset Protection Summit by the "811" group.